Castlevania: The Movie | Phil-zine! And the onslaught of movies based on books, older movies and video games continue. All of the things that didn’t get me dates in High School seems to have caught on in popular culture, oh to be fifteen again! I always seem to be a bit ahead of the curve. This newest draft of the newest rehash of a classic video game is currently being written by cult favorite comic book writer and sometimes author Warren Ellis. His “Transmetropolitan” about a futuristic gonzo journalist, based on Hunter S., was smart, hilarious and vulgar. Actually most of what he writes can be pretty vulgar. He’s posted a page from the script (here) that I can’t imagine will be included. For obvious reasons when you’re turning a kids video game into a movie you don’t include a scene in a bar in which they’re talking about a guy who sleeps with sheep. One of the original drafts, so says imdb.com, was written by Paul W.S. Anderson. The writer/director of other fanboy movies like “Mortal Kombat”, “Alien vs. Predator” and the sometimes enjoyable “Resident Evil” trilogy. I don’t mind if these adaptations continue, so long as they are no longer written by Paul W.S. Anderson. Hopefully Ellis will be able to pull something together that isn’t vulgar just to be so, but is full of the intelligence and wit he’s brought to some of his comic book titles. What do you guys think? Is it worth taking all of these wonderful childhood memories and risking those memories for an afternoon at the movie theatre. I asked knowing full well that I would love to direct a “Zelda” movie! This entry was posted on September 14, 2007 at 9:38 am and is filed under Film Criticsm, Video Games. You can follow any responses to this entry through the RSS 2.0 feed. You can leave a response, or trackback from your own site. With maybe the one somewhat-recent exception of an industry titan throwing his full money and muscle (and unfortunate copyright) into making a legendary trilogy look as stupid and contrived as possible, I don’t think most originals are hurt much by bad remakes. These things have a life of their own, and the crap (Elektra, Catwoman, Street-Fighter, etc.) is usually forgotten in a few years. So I don’t see it as a risk. I think the more movies they make, the more chance there will be for these old experiences to come alive in new ways, or at least to finally earn some legitimate cool. Have you seen any of the old He-Man cartoons recently? They deserved the movie they got. As for games, I don’t see why it shouldn’t be the same. We’re going to get standard, crappy action flicks anyway, so why not give the characters names we recognize. Then maybe some director, who’s also a fan, will actually care and give us something better than average, and if we’re lucky, another Spider-man 2 might appear. You mention ‘turning a kid’s game into a movie,’ but that’s not entirely accurate. Lucas made the same mistake. These things are generational. Castlevania is a game that belongs to kids from the late 80s, and now those kids are adults, so making their game into a more mature movie is appropriate–despite what the hungry marketing department ultimately makes the movie into. Besides, today there are few “kid’s games” out there. Mostly, kids are practicing their killing skills in HD, which, to me, makes some joke about a sheep absurdly innocent in comparison. Yes, but none of us have forgotten “Elektra”, “Catwoman” or “Street Fighter”, they all remain blights, laughable jokes and I can’t imagine a studio exec ever wanting to make another “Catwoman”, confusing the fact that it did poorly because the movie sucked with it did poorly because no one wanted to see it. And does the fan base want to see another “Catwoman” because of it? A bad “He-Man” movie makes us look back on the cartoon with less reverence. That being said, I guess all it takes is time to separate the studio from old experiences, multiple changing of the guards perhaps, because with the success of “Transformers” they are planning another “He-Man” movie. Do you still think it deserves the movie it gets? I hope it’s better than that. Finding a director who’s a fan isn’t always the best idea. Paul W.S. Anderson is a fan of many of the films he’s made. He could have all the excitement in the world and still have the vision of an unsalted peanut. Not that I haven’t kind of enjoyed some of his films – looking forward to “Resident Evil 3”. And too much love almost killed “Spidey 3”. 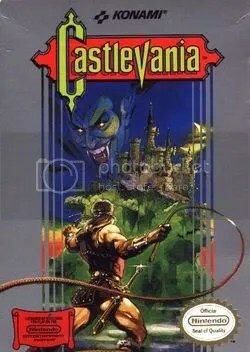 Perhaps, the problem I see with “Castlevania” is that it was incredibly generic. It comes from an era of incredibly generic games. How about instead of having the character as a ninja this time, we redress him, throw up some crosses, give him some different weapons, have him fight different bosses in an unmoving square room at the end of each level and viola – vampire hunter in a Ninja Gaiden/Mega Man/etc. game! It was always the imagination that filled in the blanks with the games from the late 80’s, early 90’s. “Kung-Fu” anyone? It wasn’t until “Symphony of the Night” that the series took on a certain aesthetic beauty before dropping off into mind numbing 3-D repetition. To this day it’s remained a pretty much bloodless, old school style video game. And my worry is that it won’t keep that old school flair of being a kids game that allows the imagination to run rampant, but that it will be another high voltage update for something that they think a group of kids now will want, or that those kids who were young then will want to see, as Lucas did. This is all basically fluff talk. But it all boils down to a bunch of studio heads that perhaps have never played the game trying to figure out what kids and fans want to see. And as far as studio heads are concerned if you threw a giant transforming robot into the mix and called it “Castlevania” they would still be happy. They could just make one movie called ‘CastleHeMania vs. the GI Thunderformers’, and have Lucas write it. It would only do well if it began like this: “Indiana Jones and the CastleHeMania vs. the GI Thunderformers”. Actually they’re also talking about a “Thunder Cats” film. That, I’m looking forward to. See what they do with all of the sexually repressed energy from the cartoon.